Juliette Has A Gun is an independent French Perfume Company created in 2006. It consists of 5 original scents, and a purse fragrance in the shape of a bullet. So why the name Juliette Has a Gun? Juliette is the Shakespearian heroin who intrigues the world. The "Gun" is a metaphor for perfume, weapon of seduction. What lured me to this company? The name of course. I had to know what this smelled like, and I was a little leary to say the least. 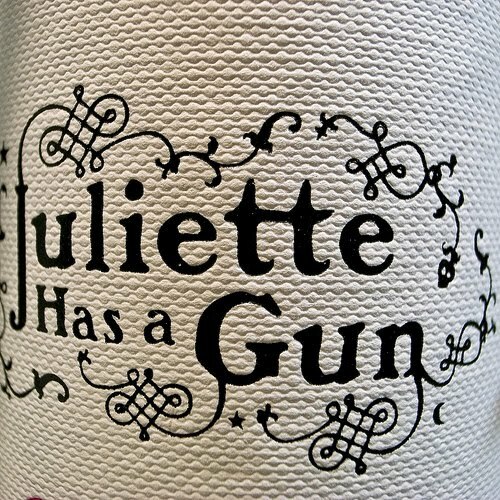 Juliette Has A Gun, is not a perfume. It's a fragrance made out of one element, Cetalox. Usually Cetalox is used as a back note in other perfumes, but for this special mixture it is the main ingredient. It's also made out of Abroxan which is the synthetic form of Ambergris. Juliette Has a Gun is available in two sizes, 50 ml and 100 ml. The 50 ml (which is the size I received) sells for 65 euros which is around 86 bucks in the US. 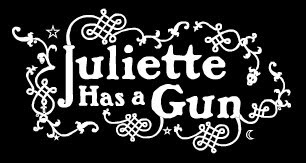 Juliette Has a Gun is 100% allergen free, which is another plus. It is elegant and pure. Their slogan is simply, "Not a Perfume." The bottle is romantic and made beautifully, with the etching of the name scribbled on the top lid. The boxed container comes wrapped with a ribbon and perfect for gift giving. I've tested several European perfumes in the past and found them to be a little too strong and not really my style. Quite honestly I was expecting the same out of this scent. I have heard about the ingredient, Cetalox , but after researching, I was still a bit confused. All I got out of my findings was it was some sort of amber, flowery scent. And as you all know, I'm not a fan of flowery smells. So ok, the scent was going to be flowery, I'm already realizing I won't like it. But hey, I like the name and the packaging! When I first sprayed Juliette Has a Gun, it was love at first sniff. This is not strong at all, in fact it's a light fragrance with a hint of flower, it almost reminds me of Dolce and Gabbana's light blue. I'm not quite sure why the slogan is, "Not a Perfume", because to me this is not only perfume, but my new favorite! The reason this is listed as "Not a Perfume" is because a perfume is a composition of scents, while this is just one note. And the scent lasts you a couple hours, it's not one of those fragrances that leaves immediatly. It lingers on your skin and clothing. It has a beautiful romantic scent that is sure to attract others. If you have smelled Dolce and Gabbana's light blue, and you love it, I think you would love this too. I received the smaller bottle which is still a good sized container, but I know I will be purchasing the 100 ml next, although it will set me back a little over 100 bucks. To me, this is worth it, even though you will also have to shell out for shipping overseas. I'm happy with Juliette Has a Gun, and it really is #1 in my perfume drawer, (and trust me, my perfume drawer is huge). I did a rating system on this site, I would give this fragrance an A+. No joke. Buy:To purchase Juliette Has a Gun, visit JulietteHasaGun.com. It's available in the US, just check their site to find the closed location to you. They also sell Lady Vengence, Citizen Queen, Calamity J, Midnight Oud and the Purse Bullet. I'm hoping one day soon I will review the other perfumes to see if they are half as good as this one. This is by far my favorite scent of all time. Do you have a favorite? Disclosure: I received a bottle of perfume from a PR rep working with Juliette Has Gun. All opinions are my own. No monetary compensation was received.